You are going to have to forgive me for two major things here today with this blog post. And I am really sorry. 2. This is probably going to be the most racist post I've ever done. And for that, I am truly sorry. But seriously, this is the LEAST Mexican Mexican restaurant I've ever been to. You know that you are going to get completely wrong Mexican food when there isn't a single Mexican individual eating or working at the restaurant. Okay, okay. Enough of that. Let's talk about the food. First up, my chimichanga, as shown above. I know. You were probably as confused as I was when this came out. 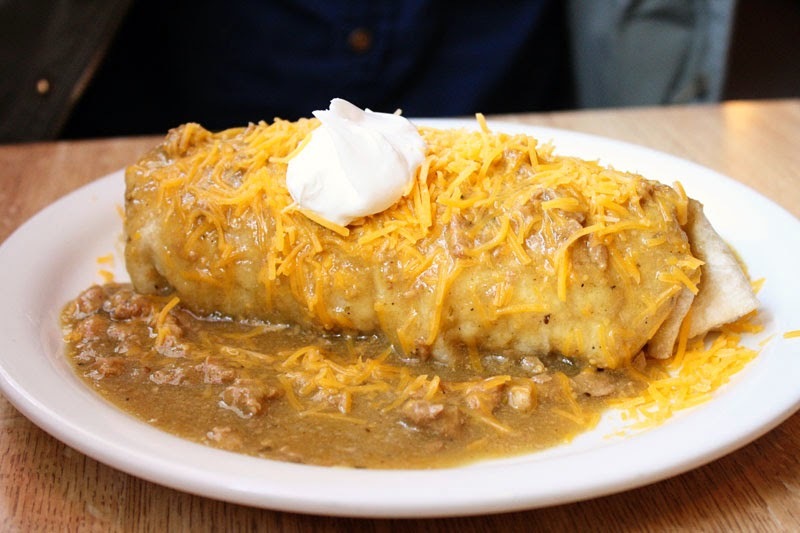 A chimichanga, according to Webster's Dictionary (and I type this with the utmost irony), is a deliciously deep-friend burrito (in more or less words). This thing was just a soggy smothered burrito, if it had been fried, it was a couple days ago because there was literally no crispiness to the burrito at all, and it was just swimming in the most flavorless, bland tomato sauce, with exceptionally pitiful toppings. Sad iceberg lettuce, canned olives, and piped sour cream, all trying to mask which wasn't even that good of a burrito/non-chimichanga. I didn't even finish it. Owen got three tacos, because he was in a taco mood and couldn't decide if he wanted a flour, soft corn or hard corn tortilla. So, all three it was. They were all filled with the famed American-Mexican mystery meat (presumable some ground beef of sorts), that weak-sauce iceberg lettuce again, and shredded cheese. Your bare bones. Granted, the meat was certainly more bearable than its competitors, like Taco Bell or Del Taco, but it was really just kind of sad. The best part of this whole experience was that we found a new talent of Owen's -- taco hand modeling! I mean, come on, that looks really nice how he's holding it. We eventually found some "taco sauce" which made the totally dry tacos a little better, but the sauce was nothing exciting, and the whole thing was just underwhelming. If you're going to do the cheap, American Mexican food thing, fine, just don't charge prices that are similar to what I'd pay at Cafe Rio for food that is actually delicious. We got the fresh raspberry shake, and yeah, it was good. You could tell there were actual fresh raspberries in there. It wasn't blended a bunch, so every now and then you'd get a big ol' chunk of frozen berry, which was a little unpleasant, but I'd be willing to go back and try the peach shake, since that sounds pretty good. What You Should Do: People. We live in a mecca of Mexican food, in all its varieties. I appreciate that this place is family-owned and local and all that jazz, but we have SO many other places that are way better, and better priced. 180 Tacos. Maria Bonita. Laura's. El Gallo Giro. El Mexsal. In fact, the next two blog posts I have are Mexican restaurants (go figure). The list goes on. And so should you. We were so disappointed after this meal that we wanted to go and eat a second dinner to make up for it. We didn't of course. But we wanted to. What We Ordered: Pork Chili Verde Skillet and Penny Pot Potatoes, both with sides of Pancakes. Ohhhh Joe's Cafe, I hate to do this to you, but I may have a new favorite breakfast place!!!! Of course, this one is in Salt Lake, so maybe we can still be friends? Penny Ann's Cafe is a tiny little place hidden in the base of a sorta-ghetto apartment complex that you would definitely miss if you blinked. Is this the secret to excellent breakfasts? Not sure, but I definitely see a trend. 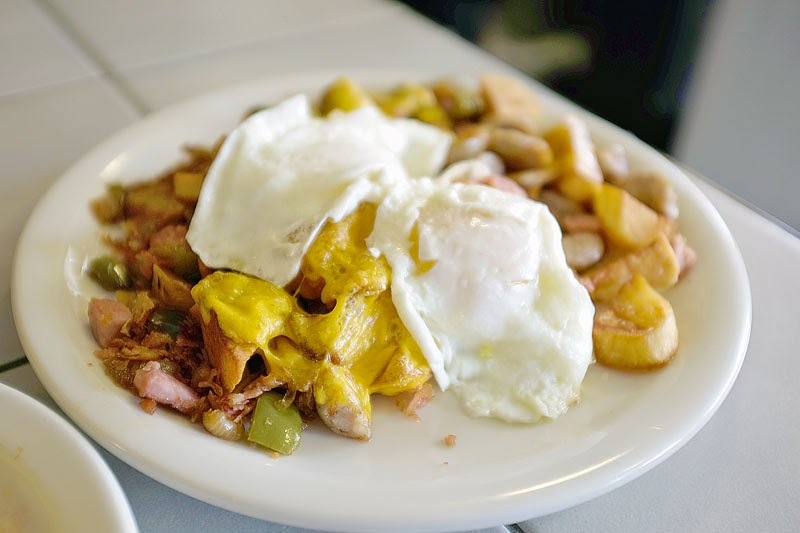 They have these skillet breakfasts, which are basically everything good about breakfast, chopped up and pan-fried together. YUM. 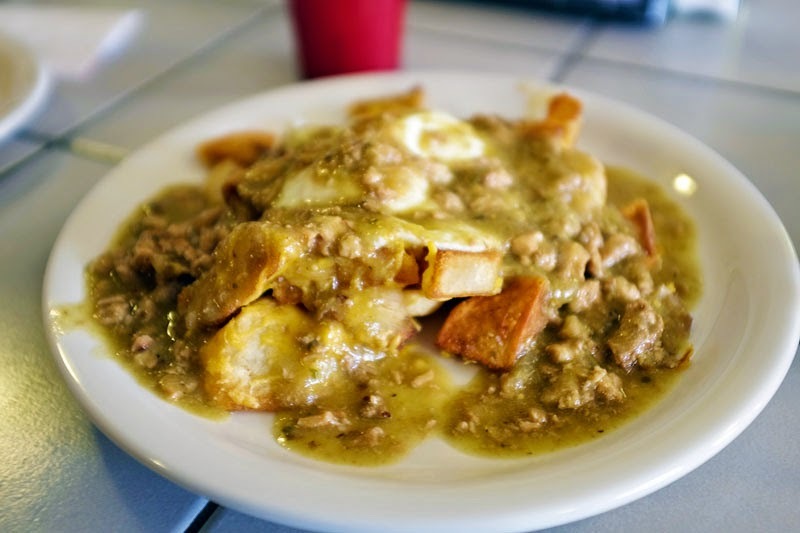 I looove their Mexican-inspired breakfast foods, and this place sure knows how to make a mean chile verde. Their eggs are always perfectly cooked, and you can definitely plan on bringing some home for breakfast tomorrow. I mean, just look at that burrito! These are the things that burrito dreams are made of, my friends. And the flavor definitely matches up to the size -- it is seriously so good. And good luck eating all of it! The best part of all of these meals is that they come with a side of the best dang pancakes you've ever had EVER. 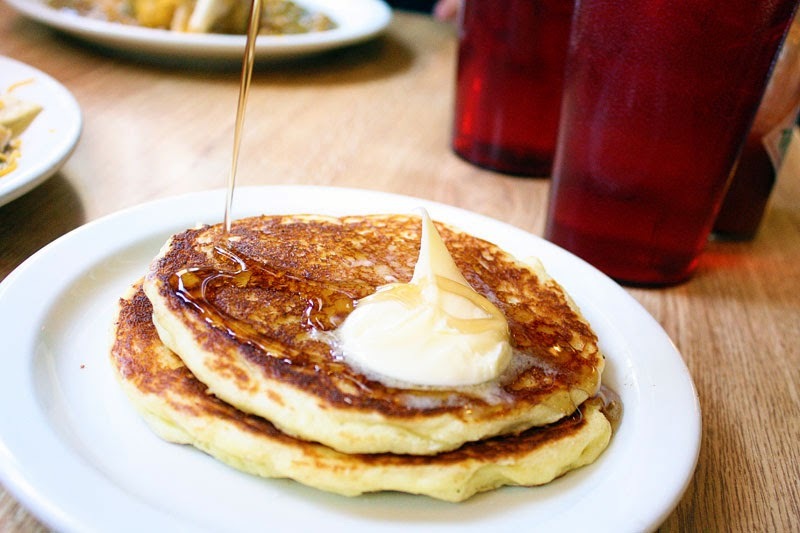 They are sour cream pancakes, and are somehow so much lighter, fluffier, and tastier than any pancake you've ever had. It is truly a mystery, and one that I would like to spend my whole life solving. This side of pancakes could definitely be a meal on it's own. But why would you limit yourself like that? But please, at least get the pancakes. I love them so much!!!! 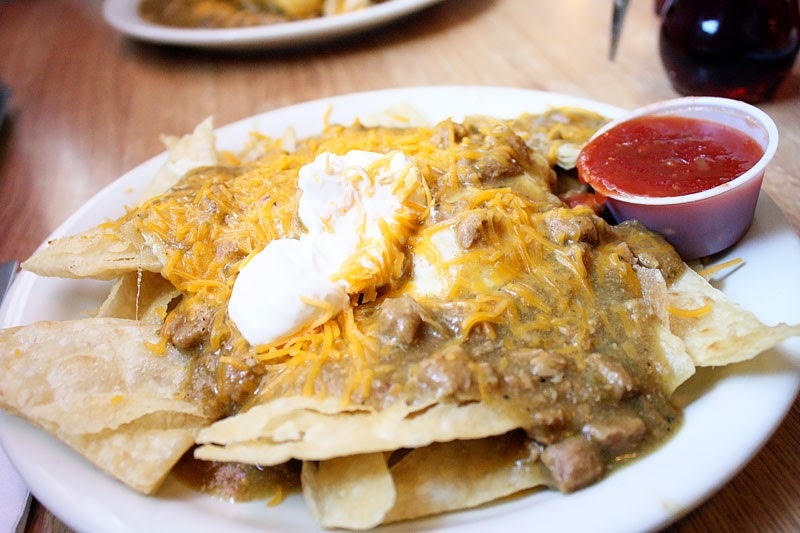 And this one's my favorite -- breakfast nachos! Oh yeah. It's true that the sauce seems to be the same between the burrito, skillet, and nachos, but when you have a good thing going, why mess it up? The nachos are on these homemade tortilla chips that rival Lone Star's, and the chile verde sauce is just sublime. Plus - NACHOS FOR BREAKFAST!! Penny Ann's is also known for their spectacular pies, and though pie for breakfast is a little intense, even for me, we got one to-go once (lemon raspberry), and can indeed confirm that it was truly divine. Can't wait to try the others. It's Thanksgiving season after all, right? What You Should Do: Best Brunch Place Ever. I would say breakfast, but there is so much food with each serving, that you should probably count it for both breakfast and lunch. But it's reasonably priced, ultra friendly, and MAN THE FOOD IS GOOD. Especially the pancakes. Oh heavens, those pancakes. Keeping in the tradition of overpriced restaurants lately (sorry, I promise to get some cheap stuff on here soon!) we decided to venture to the well-known and oft-debated Cheesecake Factory. We went to the one at City Creek, though I am pretty sure they all get their food shipped in from the same provider and that it all tastes exactly the same no matter where you go so...yeah. Apply as you may. We started with the Tex Mex egg rolls, because you know my weakness for these special/weird egg rolls from CPK. Mmmm.. Look at that grease pile. And sooooo much sour cream. Yeah. It's all a fat bomb up in here. The egg rolls were filled with chicken, black beans, cheese, peppers and onions and were certainly flavorful. And filling. I was totally full after the bread and appetizer. And what else did we have look forward too -- more fat! Oh yeah! I know Cheesecake Factory gets a bad rap for being calorie-loaded and this mac & cheese burger totally lives up to that reputation. I mean, it's not like we were expecting anything else when we ordered this, but it was still pretty funny. On top of an actually decent burger, they placed a fried wad of mac & cheese, and then drizzled it with cheese sauce on top. Hahahhahahaha oh man. This thing is nuts. It actually tasted pretty good (I really liked the bun!) and the fries were quite tasty, but yeah, you can't eat anything else for a week after this not-so-little guy. I went and ordered something off of the SkinnyLicious menu, and can I just say, it is SO embarrassing ordering off that menu. I mean, can you imagine if you were a guy ordering off the menu? Not to be sexist, but even as a female, it's totally humiliating. ANYWAY. Got the SkinnyLicious Factory Chopped Salad, which is supposed to have chicken, avocado, corn, bacon, tomato, apple and blue cheese. Immediately I was put off because, as you can see, the hunks of blue cheese were gigantic - and blue cheese is something that's better as an accent, not a mouthful! But I decided to start into the salad anyway, only to find that the taste was just...off. I'm not sure if it was the lettuce or the dressing or what, but it was bitter and weird tasting, and it totally made me lose my appetite. So I sent it back (I'm becoming quite the complainer I guess...) and then was done for the meal. YUCK. Couldn't eat it, not sure why but the ingredients were not very fresh and it was just all kind of gross. The cheesecakes were obviously pretty good. I do have to say that I am a sucker for all of the flavors they have - it's so exciting. I really like the peanut butter one, and cheesecake is way hard to make at home, so this part is pretty good. They were both a little dry, but overall, tasty cheesecake with fun and unique flavors. What You Should Do: The server told us that she would take the cost of the salad off our bill, so I was surprised when it still came out to be $60! It would have been closer to $75 with the salad! I don't know about you, but that is totally not worth it to me. There are a LOT of other much more delicious restaurants out there (just click here for some excellent choices!) that you can go to for special occasions. The Cheesecake Factory is just too cookie-cutter now (excuse the really lame dessert pun) and the food all tastes just kind of tired. And expensive! I'd probably only go here again for the cheesecake, and even that can have better options elsewhere. You won't have to order from an embarrassingly-named menu, you won't have to wait an hour to be seated (you may even be able to make a reservation! ), and you won't have to be ashamed of all the calories you mysteriously consumed. Plus the accordion player never came to our table and asked what we wanted him to play! Totally bummed. I had a great song picked. Also a bummer - this salad. Why do restaurants insist on putting unmixed salads in bowls that are reallllly hard to mix in? Beats me. But the salad was boring, and I didn't really even eat it because, well, I'm already bored talking about it. Let's move on. Owen started with the Tomato Basil soup, which was much more exciting. In fact, yeah I stole it from him. The soup was creamy and wonderful, and may even be better than Zupas. I know, hearsay. But it was really great! Definitely the highlight of the meal for me! I got the butternut squash ravioli with sausage and four cheese sauce. 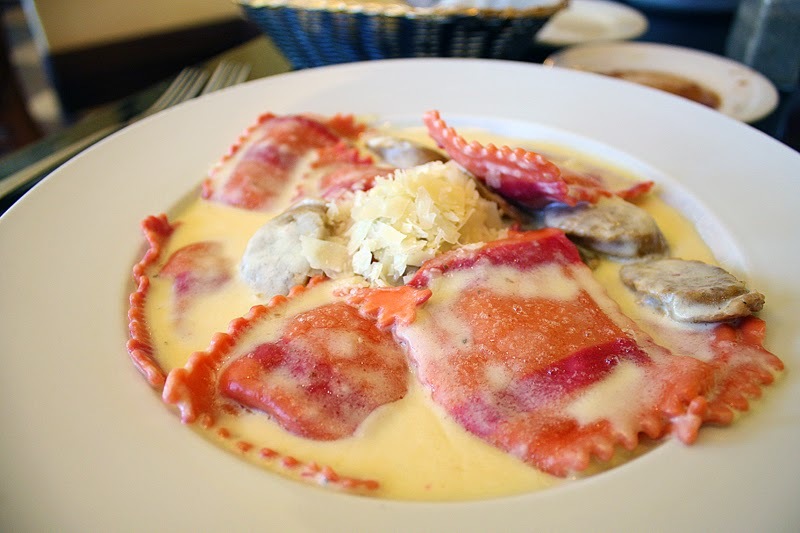 The sauce did look like it had kind of been sitting a while, but the ravioli were really flavorful and delicious. It was a little weird though, because it totally reminded me a LOT of this pasta...Not sure who the original is, but our server assured us that they make all of the pasta in house, so I don't know...anyway, it was good. The sausage was flavorful and the sauce was certainly cheesy, and it was just a good all-around comfort meal. Owen's dish was also high on the comfort-meal scale - I guess that's kind of an Italian food thing? I don't know. But he got the gnocchi in their signature sauce -- a creammmmy tomato sauce with cream cheese mixed it. Wowza. It was hearty. The gnocchi was pretty good. I think it was boiled and pretty sfot, and I really like it pan-fried for a bit of texture contrast, but that's getting nit-picky. It sure was a lot of pasta, and we took a good amount home, which is always nice. We thought about getting dessert, but tried some of the gelato and found it to be icy and weirdly-flavored (and I normally totally dig gelato...), and the other desserts looked like they had been on display for a while, so we opted out. What You Should Do: Pretty good, but $45 worth? I don't know. I think we probably made some of the best choices (I know, I sound super full of myself here...) with our meals -- ordering Italian options that can't be made as easily at home, which made the cost seem more justifiable. But still, it's a pretty expensive choice. I definitely think this would be more tasty on one of those chilly winter nights when you just want some comfort food, and make sure to order the tomato basil soup and put in an accordion song request for me, would ya?